It’s the semi-finals of the Golden Sprint tonight and regular readers of this column will know all about three of the eighteen left. Tonight’s focus though is away from the showpiece competition and on greyhounds making their Romford race debuts and stepping up in trip. As ever yours truly has endeavoured to find out more about them. Express Warrior has certainly hit the ground running after arriving from Ireland. Trained by Henlow’s Cornelius Condon the June ’16 whelp has won two from two on these shores in graded races at Henlow. His first win came in A8 company then went straight into an A2 graded affair after a superb track debut. The six grade hike did not stop the son of Laughill Blake and Express Micro who won that by three lengths in a eleven spots improvement from his first win. Tonight he races around Romford for the first time in a Maidens race over 400 metres at 7.33pm. He has had a look around the Essex venue clocking a respectable calculated time of 24.33. Trainer Cornelius Condon on Express Warrior said: “He’s coming on nicely. He’s a nice dog. He had a few niggles when he came over but is absolutely fine now. “Romford should suit him well. He did a nice trial and should improve a little for the look. If he breaks I think he could win. He has trap one and needs the rails. He’s a dog who is well in himself, he is bouncing. He should do well tonight though it is a tough race. Express Warrior is generally available at 9/4 to win on his Romford debut. Monmore trainer Lee Field is back to Romford from his Nottinghamshire base to give his Smokestack Stan his Romford debut tonight. Entered in the maiden stayers race at 8.06pm the January ’16 whelp is not only making his Romford debut but his six bend one as well. Over 575 metres the son of Farloe Blitz and Affection will be looking to shed his maiden stayers tag at the first time of asking. He has had a look around the Essex venue with a sprint trial over 225 metres clocking a decent calculated time of 13.92. His one previous race on these shores was at Swindon over 509 metres finishing fifth. His future however may lay over six bends. Trainer Lee Field on Smokestack Stan said: “He had a trial in the week. He had a look and tiptoed around. That’s understandable. The look around will benefit him massively. He had a trial around Swindon before his first race and drove the bends a lot better in his race. He ran at Swindon and was only a couple of lengths behind a good dog. That was over 509 metres and he does need six bends. He will get the trip tonight. Ladbrokes and Coral make him an 8/1 shot to win over six bends at the first time of asking. Early risers would have seen Droopys Noodle’s victory in the Peter Bussey memorial at Crayford recently. Over 540 metres the January ’16 whelp claimed the spoils for connections and local handler Dean Childs. 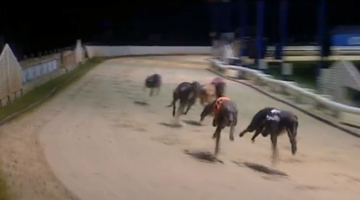 The son of Droopys Cain and Droopys Loner is flying winning five of his last seven. His strike rate of ten wins from seventeen says it all. He has form around Romford winning over 400 metres. The trip tonight should not cause the classy sort too many problems. Tonight he runs in the second heat of the Friday night stayers at 9.26pm. Skybet make Droopys Noodle top price 15/8 to win over 575 metres tonight.